I know I love to curl up in my backyard with a cup of coffee or glass of wine each evening and enjoy the peace of the day. 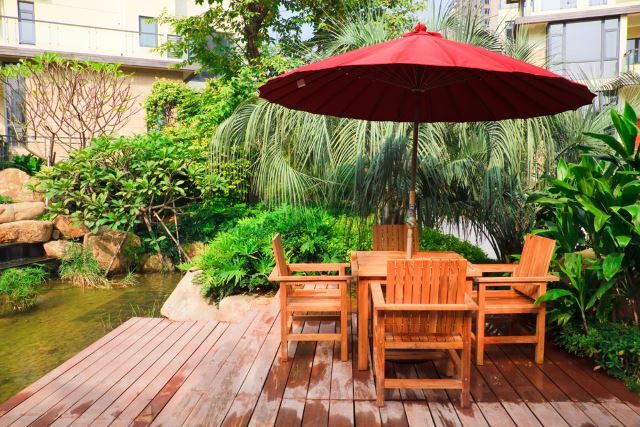 Your backyard is very much an extension of your indoor living space and, no matter the size of your area, it can be enjoyed as a place to relax within at almost any time of the year. The use of outdoor furniture that can withstand weather fluctuations helps create the ideal outdoor space and allows you the opportunity to entertain in comfort. 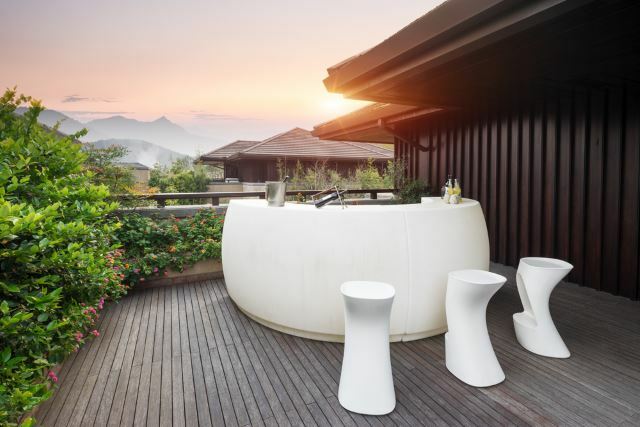 We’ve compiled some of examples of our favorite furniture styles and area layouts below to provide you with backyard furniture ideas for true outdoor living comfort. The vintage feel of iron furniture never goes out of style and can be used with everything from contemporary to rustic decor. 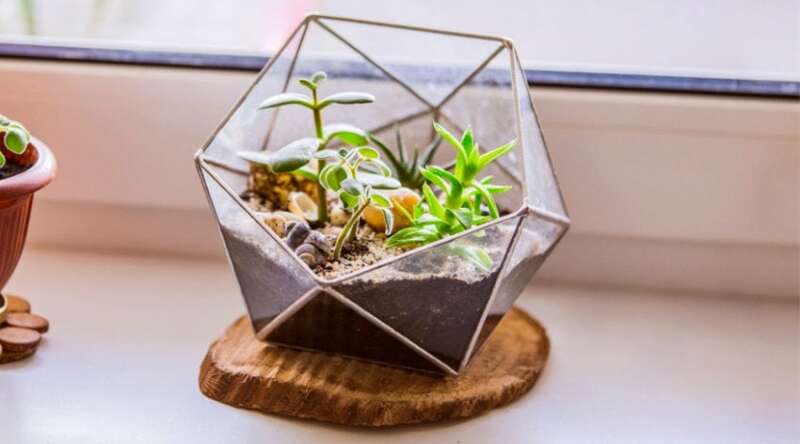 Whether you like them for simple aesthetics or as purposeful areas to enjoy your gardening, you won’t be sorry in your choice of these classic designs. 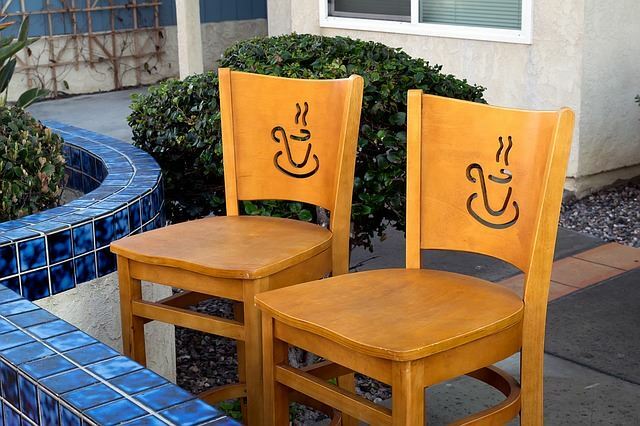 Old bar stools or school chairs are the perfect way to add inexpensive seating to your outdoor spaces. Often found at school and business auctions or flea markets, these well made relics are from an era when furniture was made to last and are easy to make your own with cutout designs and whimsical paint jobs. Thick cushions help create an ideal space for sharing a glass of wine and appetizers each evening over a good conversation. 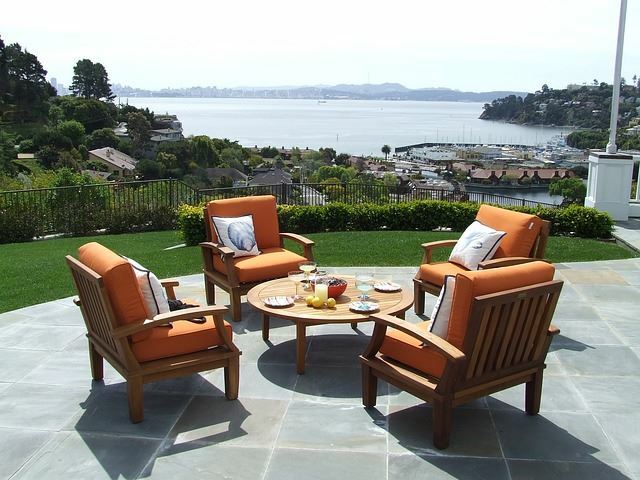 The use of outdoor furniture helps provide an inviting atmosphere and also allows you take full advantage of any stunning views your yard offers. 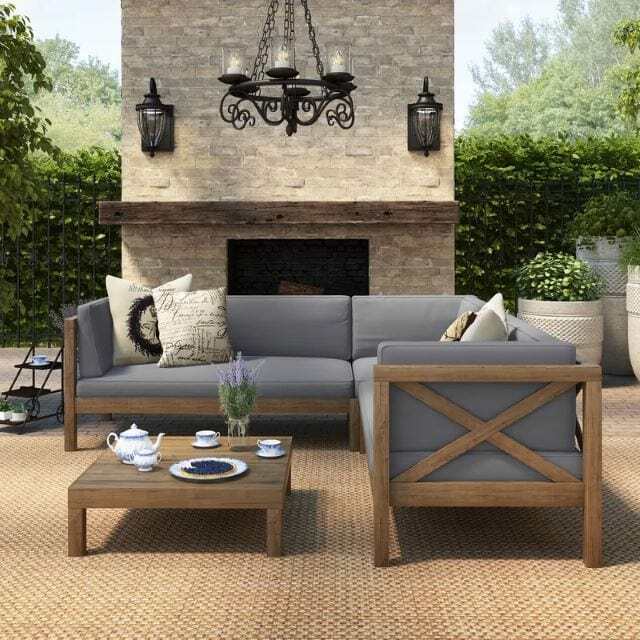 Don’t be afraid to pass up an excellent patio furniture design just because you feel it doesn’t match the housing or garden styles you would like to place it in. Mixing and matching contemporary with rustic, classic or cottage style decors can bring surprising results! 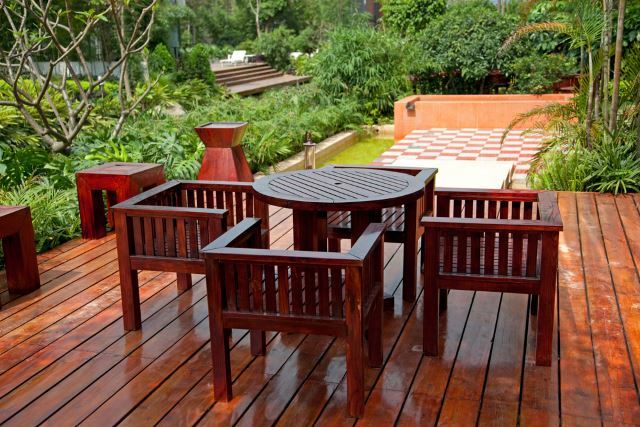 If you have an outdoor furniture vision, you may be surprised at how easy it is to have your furniture customized for you. 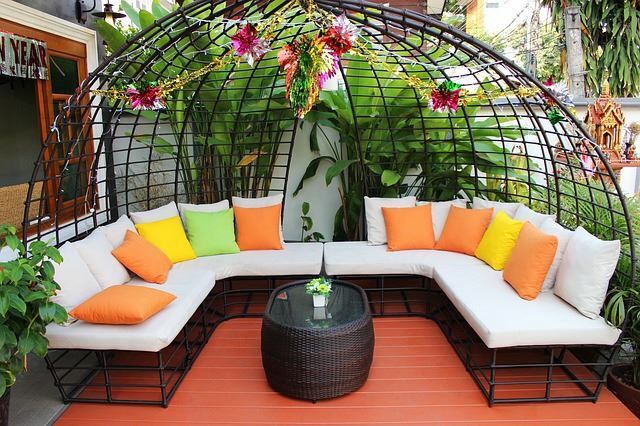 This domed seating provides endless design ideas to serve as a part of your garden with trailing vines, a place for lighting, or a simple frame for shade. 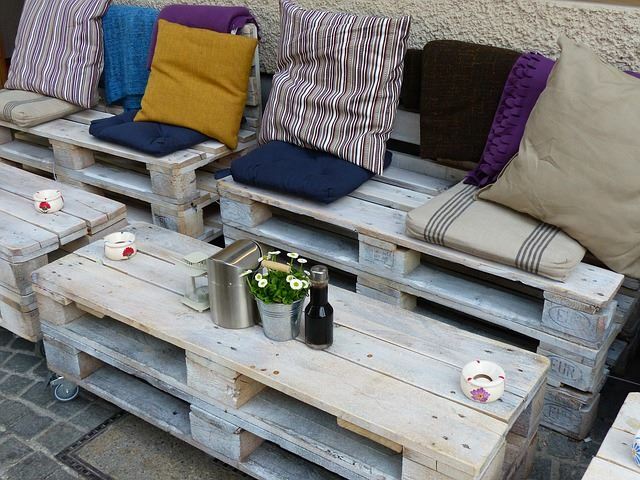 Pallet wood is an excellent source of materials to create your ideal outdoor living area. As you can see, a little bit of elbow grease to cut and shape what you need, plus a few decorative pillow and throws is all you need to create a place to sit and chat the night away. 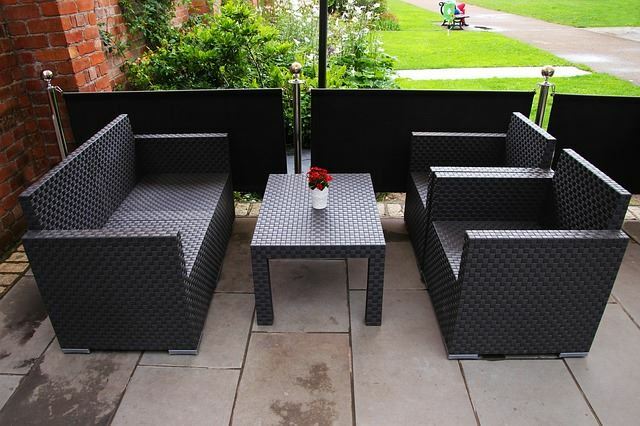 The mention of outdoor furniture used to bring to mind hard plastic or wooden chairs and thinly stuffed cushions; definitely not the ideal place to relax upon. Innovative materials and technology has allowed for whole new era of outdoor comfort products like these lounging chairs that invite you to be enveloped in their softness. 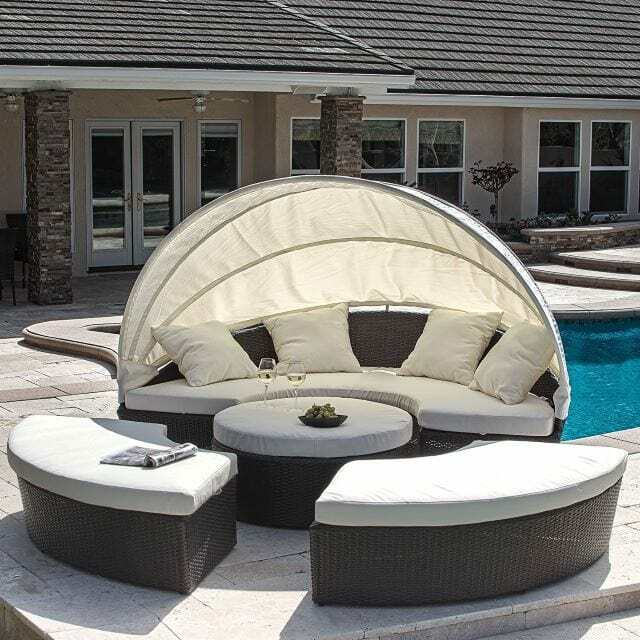 Create a peaceful and private shaded retreat with a canopied daybed set that you can entertain in or lounge within depending on your needs. 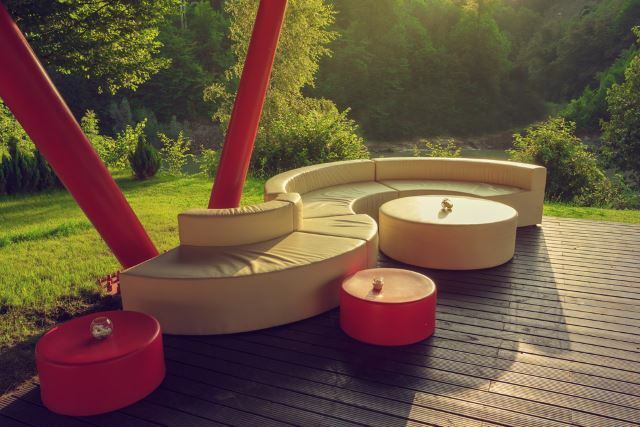 Outdoor furniture that incorporates shade into its design can be hard to find but this set is sure to please. Hammocks are a great way to imagine yourself away on a tropical retreat, even if you are only hanging next to your own backyard pool. 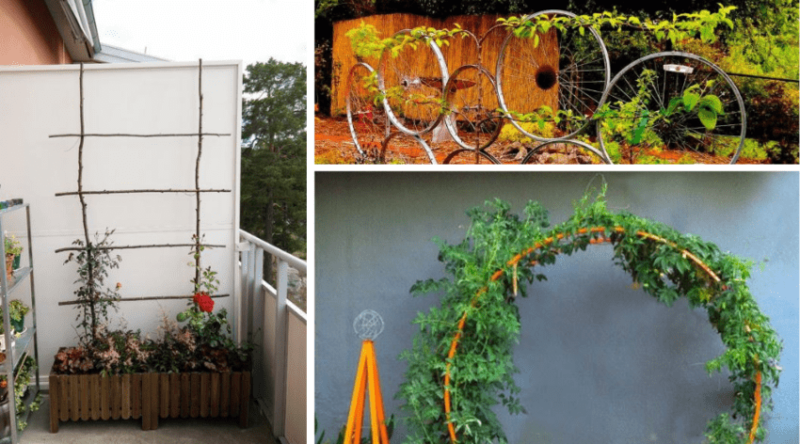 If you don’t have the trees to support a hammock, frames are readily available to help you get in the ‘swing’ of things. There is something relaxing about free hanging furniture, and this little hideaway embodies everything lovable about such a product. Curl up and enjoy a good read or a late night talk on the deck with a free hanging papasan chair to take your mind off things. 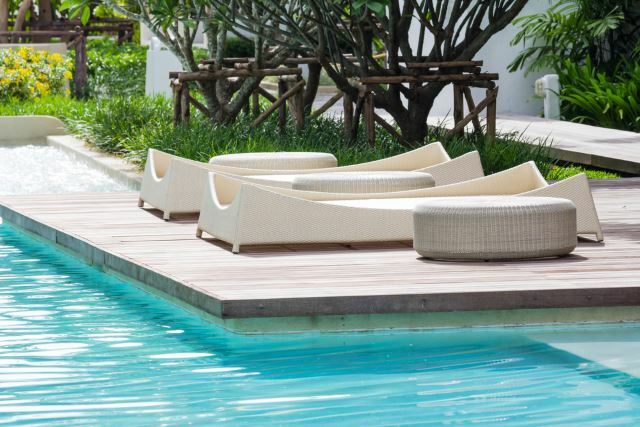 Outdoor patio furniture most definitely includes a place to take an afternoon siesta next to the pool. 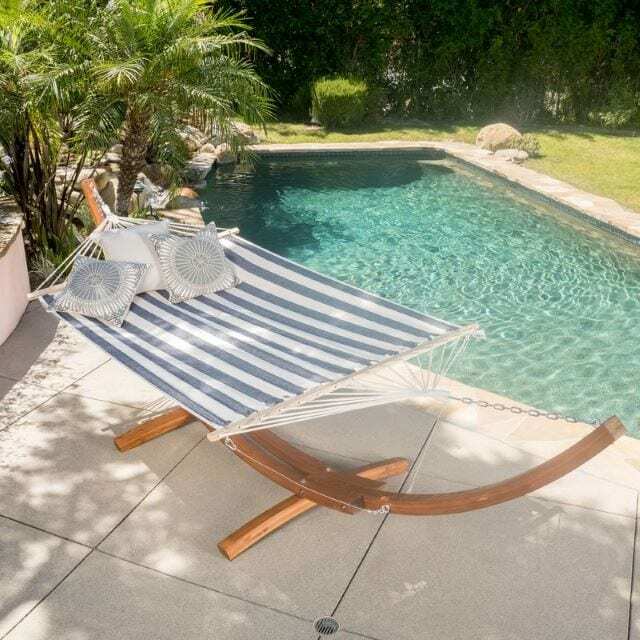 Long gone are the old style plastic recliners; these poolside beds are all you need to catch up on some well deserved rest and get a little sun in the process. Take your outdoor living to all new extremes and truly embrace your yard as an extension of your home. Outdoor lighting, carpeting, and furniture is all readily available for you to pick and choose from to create an elegant spot to entertain within. 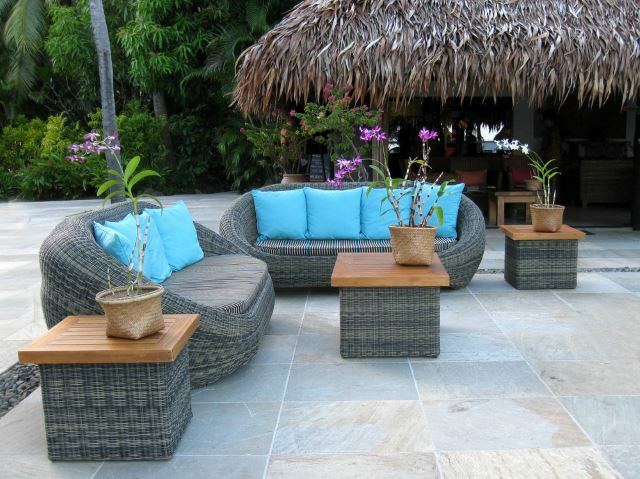 Take advantage of the outdoor influence to help add detail to your sitting areas. Cut logs make awesome tables, and a bamboo screen provides just the right amount of privacy without interrupting the natural setting. 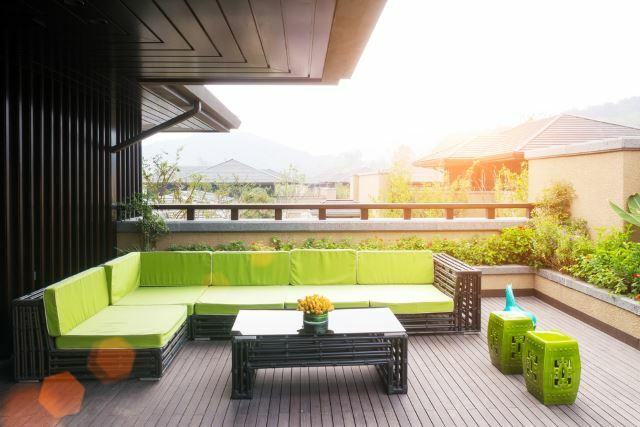 A good place to sit around is a must for all decks and patios. 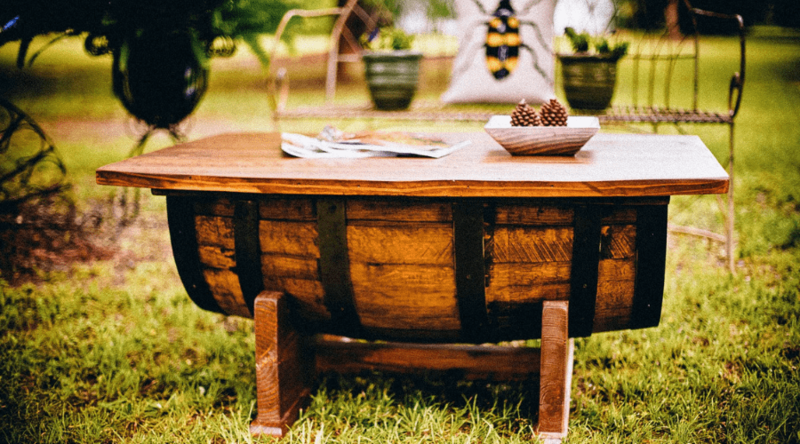 Great conversation, drinks and food all happen around a gathering table, and no yard is truly complete without one. Bring a burst to color within your sitting areas with bright hued pillows that highlight the textures and natural colors of the surroundings. 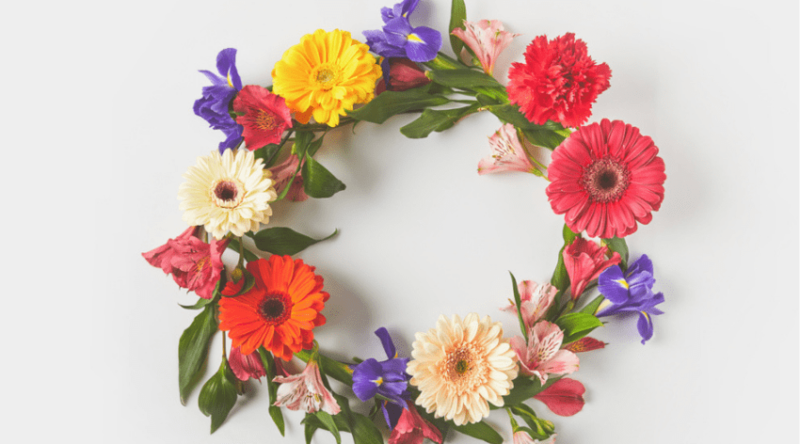 Flowers also add interest that allows your guests to enjoy the extra pop of color they bring. 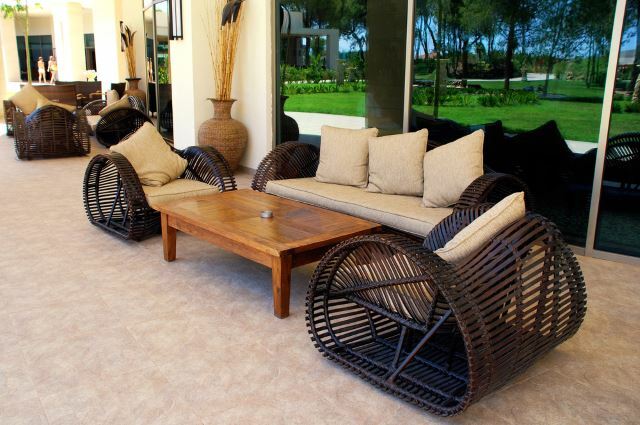 Rattan has always been a popular outdoor furniture material, but long gone are the days of plain colored, and simple woven pieces. 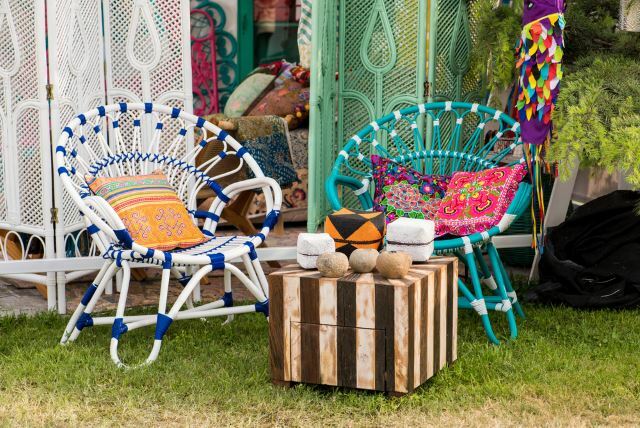 Textured weaves and unexpected colors bring a brightness to your patio in non-traditional shapes and sizes. These suspended lounging areas come in a variety of sizes to accommodate more than one body. 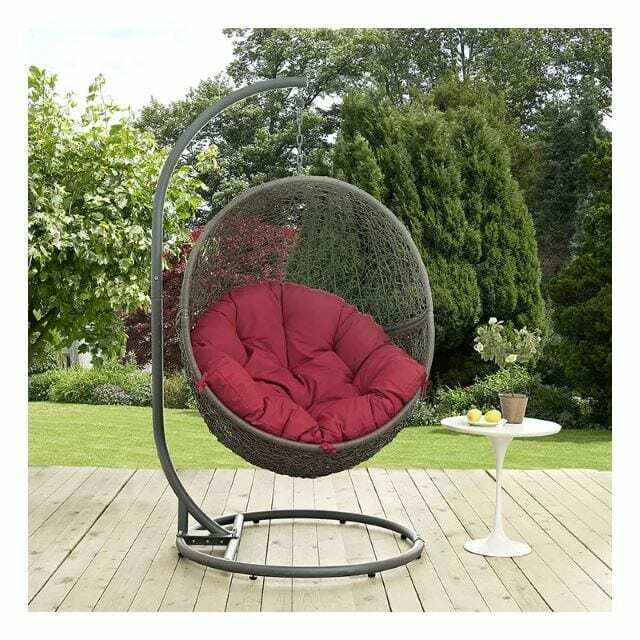 If you have a strong enough beam to hang one of these unique pieces of furniture from, they are well worth the comfort and serenity they bring while relaxing in the garden. Why have something that everyone else does? Take an afternoon with some of your favorite pots of paint and make something unique and whimsical out of your everyday furniture that you can enjoy all year round. Nothing is worse than having to pick up wet towels or trying to find a dry towel to wrap yourself in when poolside. 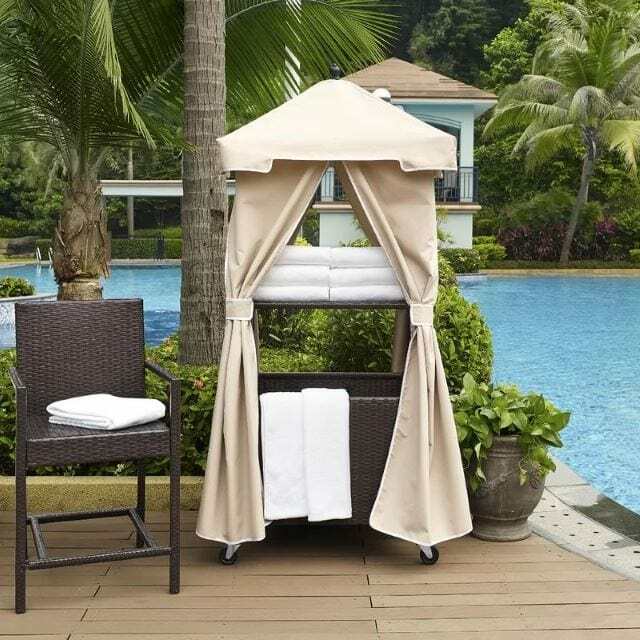 Create a simple laundry stop that helps keep all your poolside needs at hand and also provides a place to drop your towels in for quick laundering. 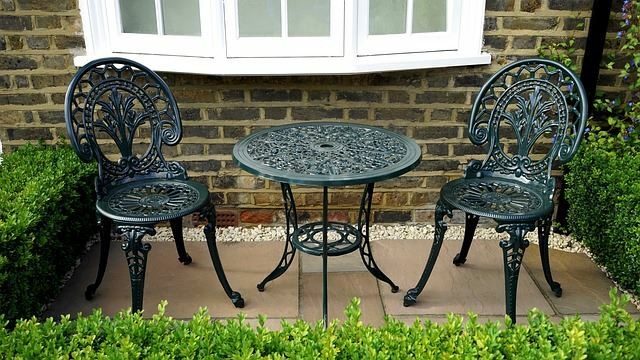 Double up the duty of your outdoor side tables by choosing those that help keep your clutter organized. 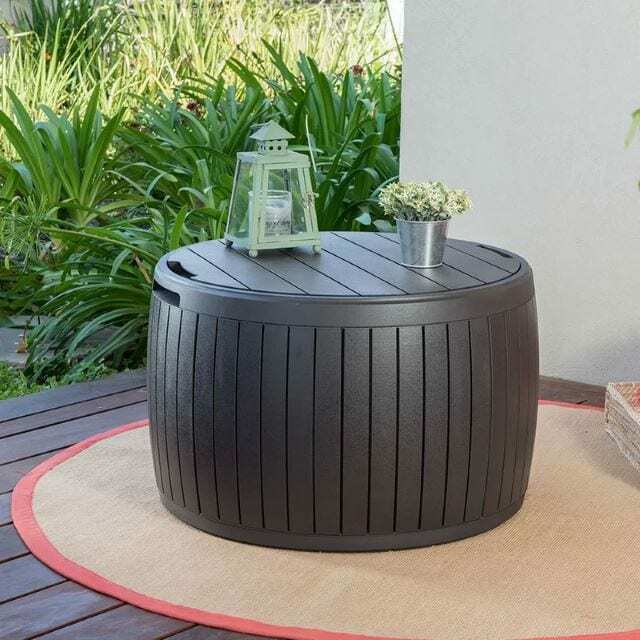 These types of tables are made from sturdy, weatherproof materials that allow you to store anything you may need to keep tucked away or protected easily and with quick access. 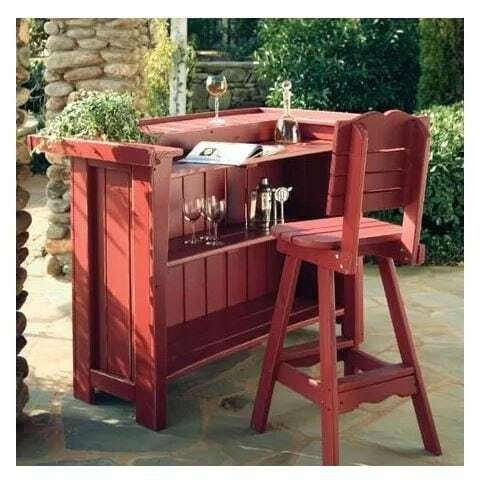 Keep an easy and portable patio bar on hand to serve up your favorite drinks in your favorite outdoor living area. 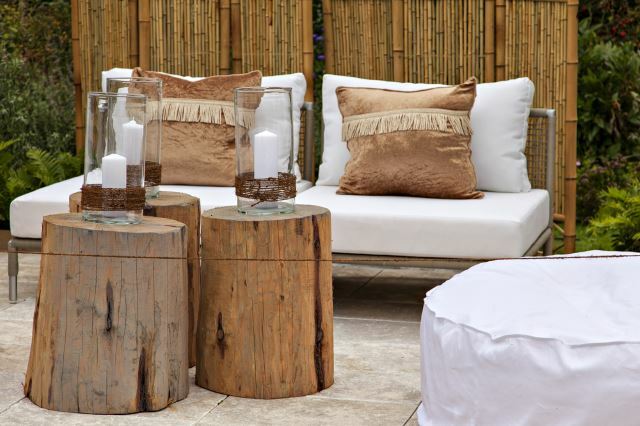 Bamboo furniture is lightweight and easy to store, plus it weathers well and provides an excellent texture and hue to your outdoor decor. 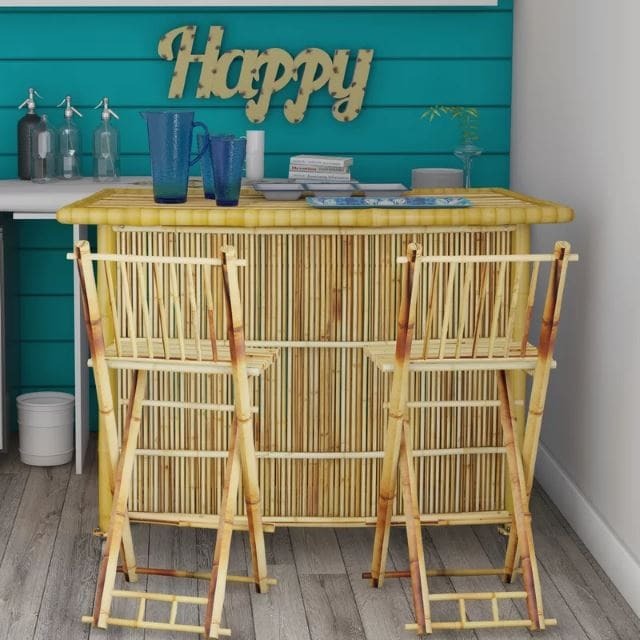 If you are looking for something a little less island themed, sleek modern lines are found in this metal and wooden portable bar that transitions easily from poolside to sunroom for year round entertainment. 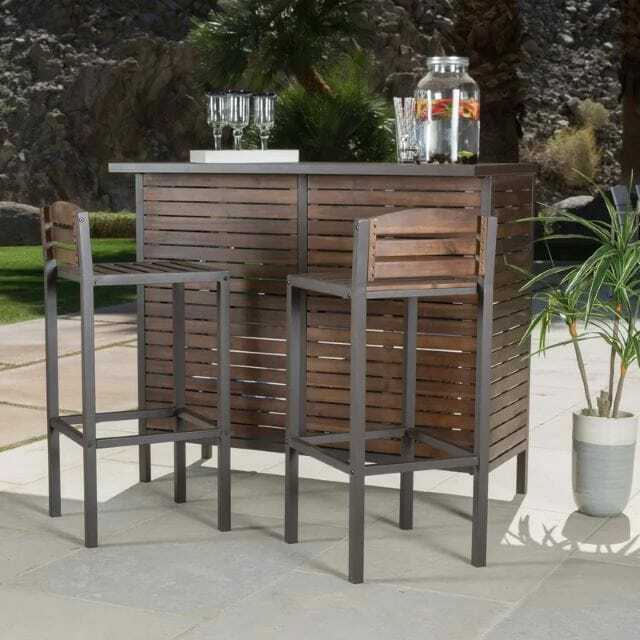 Portable bars truly do provide a finished look to your outdoor decor. They help transition a lived-in look from indoors to out and can also lend a more formal atmosphere for when you are entertaining. Modern lines, shapes and textures look just as good against a natural backdrop as any other style. If your home is more contemporary in design, carry that theme to the great outdoors and embrace the interest it brings. Save yourself the time and effort it takes to clean up after a dinner in your living room and take it outdoors. Even with company, you can purchase one-time use flatware and plates for a more elegant feel, and this way the accidental spill, or dropped food, is no longer the hassel it once was. This is especially nice if you have young children. If you have the space, go large and complete your look with enough room to allow everyone in the family a comfortable spot to spread out upon. Deep cushions allow for true comfort and a place to spend hours in conversation, or simply relaxing watching a game or movie on an outdoor television. This sleek modern bar and seating area allows for deep conversation over drinks of your choice. These are especially wonderful when placed in upper level decks, as these are to provide endless hours overlooking beautiful vistas. 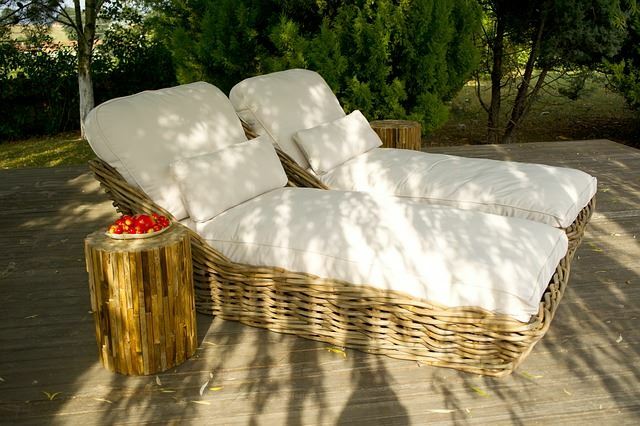 Wicker is truly a timeless classic choice for outdoor furniture and can be used in a variety of ways to provide both comfort and style. These comfy chairs, and equally comfortable loveseat look cozy and inviting. Your furniture doesn’t have to be of the portable variety. 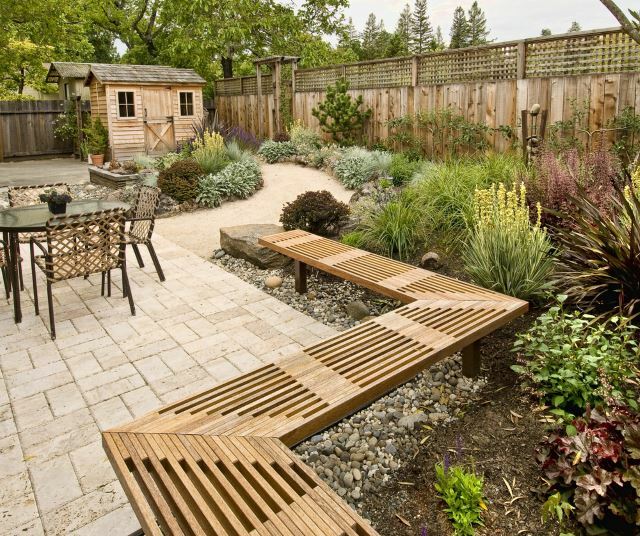 Instead, plan some benches and other permanent areas to sit and relax on when creating your landscape designs. 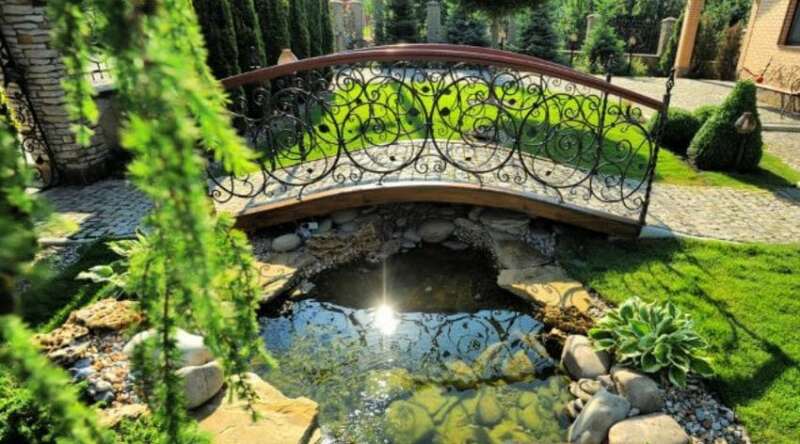 That way, you can enjoy your yard from any angle while you take a rest from your gardening chores. 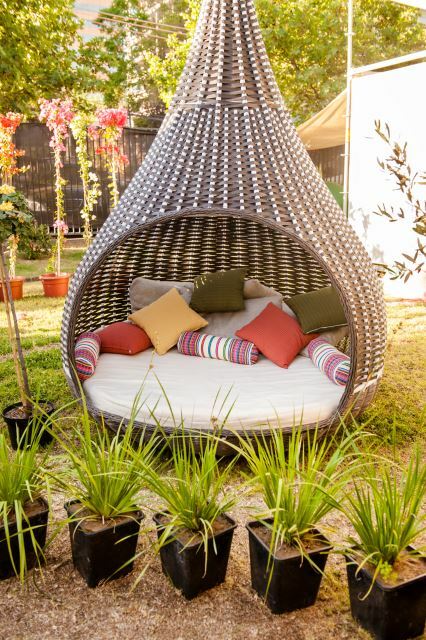 No matter what choices you make to lend the ‘lived in’ look to your backyard space, make sure it’s everything you need for true rest and relaxation. Everything from shady getaways, reading hideouts, formal sitting and service with a smile can easily be attained through the many available design ideas we’ve provided above. We’d love to hear about which are your favorites, or even what you’ve done to your own yard! Just drop us a comment below- and, as always, please share.